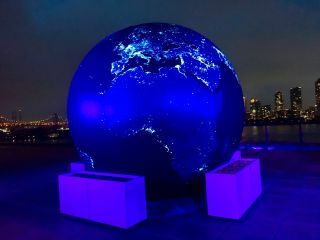 The "Black Marble Earth" was illuminated under the night sky on Sept. 25 at "Space2030: Space as a Driver for Peace," an event at the United Nations General Assembly in New York City. Designed to look like our planet as astronauts would see it at night, the structure gives viewers an incredible glimpse of Earth from space. UNITED NATIONS — Leaders from around the world gathered at the United Nations Headquarters Tuesday (Sept. 25) for "Space2030: Space as a Driver for Peace," to discuss the future of international cooperation in space. At the event, a huge, inflatable dark globe called "Black Marble" Earth stood to remind attendees of how amazing our planet really is. Human activity can be seen as illumination at night from space. The "Black Marble Earth" depicted this incredible view on Sept. 25 at "Space2030," giving viewers the astronaut perspective. The Black Marble Earth was commissioned by the Space Trust, a convening partner of the event along with the United Nations Office for Outer Space Affairs and the United Nations Office for Partnerships. The display was made to resemble planet Earth as it is seen at night by astronauts. So, black and illuminated, the inflatable structure was admired by all throughout the event. The Black Marble Earth is massive, measuring 11.5 feet (3.5 meters) in diameter. Eric Morris, founder and director of the company Orbis World Globes, said he was originally inspired to make Black Marble Earth by the photographs that the Apollo astronauts took of Earth from the perspective of the moon, Morris told Space.com. "Given the odds that me or most of my friends would have the opportunity to go into deep space and see the beautiful Earth suspended in the blackness of space," Morris said, "[I thought] maybe I could take the photographic concept a little bit further. I resolved to develop spherical models of the Earth that depicted the planet as it actually appeared from space." Left to Right: Namira Salim, Founder and Executive Chairperson of Space Trust; Lucie Brigham, Chief of Office, UN Office for Partnerships and Ian Freeman, Associate Programme Officer, UN Office for Partnerships. More than 30 years after he began making Earths, Morris said Black Marble Earth is special because it shows the planet at night. Cities are illuminated with activity. Morris told Space.com that he hopes to "share that transformative perspective" that astronauts gain when viewing Earth from space, a psychological effect and a shift in perspective known as the overview effect. Marie-Louise Coleiro Preca, President of Malta, Robert Skinner, Executive Director UN Office for Partnerships, Namira Salim, Founder and Executive Chairperson of Space Trust and Lucie Brigham, Chief of Office, UN Office for Partnerships‎ gathered at "Space2030" on Sept. 29, 2018. Follow Chelsea Gohd on Twitter @chelsea_gohd. Follow us @Spacedotcom, Facebook and Google+. Original article on Space.com.